Owning a property of your own takes years of hard work, planning, saving, investing and wood front doors dedicated work. It’s what makes you proud and what you call your very own! Just owning a property isn’t enough. All kinds of properties- residential or commercial- require constant upkeep and maintenance. When building a space one needs to look after every and each big and small detail that goes in to make it a secure, sturdy, beautiful and one that matches our personality and taste. So what is the very first thing we notice about a property? Obviously it’s the exterior that first gets noticed. The exterior of a property needs equal attention as it is the very first impression we cast on people. Anyone walking past a beautifully kept property or a poorly kept one is sure to notice it! The front door is a very important aspect of the exterior and the property in general. It is the front door that shuts the outside world out and also the main entry that welcomes and invites the world in. The front door is the very first and primary detail that requires complete and full attention. It needs to match the overall exterior of the house, be secure and sturdy, be well maintained, made of the right material to withstand external harmful effects of the environment and of course match the taste of the owner. High Gate Doors is a mark of quality. We offer all door services- installation, repair and other services. With years of experience and expertise in the field we have been able to create a pool of satisfied customers who trust our quality work and services. We believe in offering only the best of products and services and work on a foundation of complete customer satisfaction. Our wood front doors are offered keeping in mind the individual needs and tastes of our customers. Just like no two people are the same, neither are two houses or choices. Everyone has a unique and distinctive taste and our wood front doors will ensure that your front doors are exactly how you want them to be! Our team of experts can help you make the right decision. 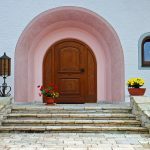 When choosing a front door many different aspects need to be kept in mind. The place you live, weather conditions and other external conditions all need to be kept in mind to ensure you get a door that stays put for a long time. Yes, style and color are equally important and we leave that completely up to you! The beauty and charisma of wood front doors is evergreen! 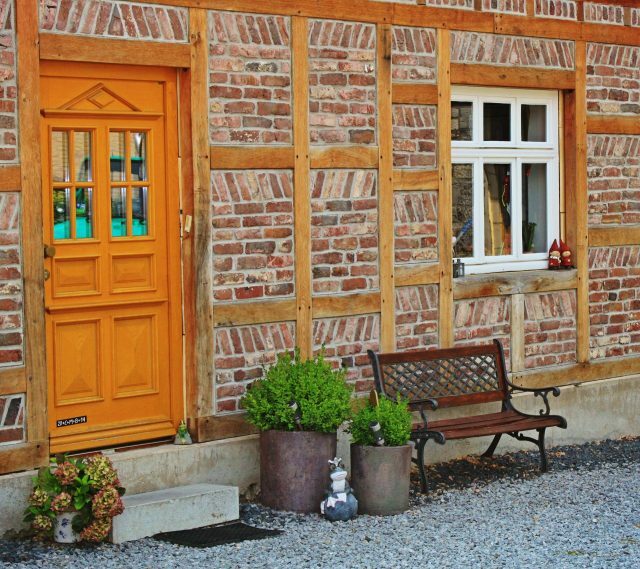 Any property can transform into an evergreen beauty just by adding a wood front door. Whether you live surrounded by greens or live in a maddening cemented jungle, wooden charm cannot escape any locality. It has been the favorite material for ages and there is no doubting the preference. Owing to advancements in technology, it is now possible to produce wood front doors that can withstand external damaging forces to a great extent. The ability to combine wood with other materials makes them stronger, more secure and highly sturdy. The designs and style options are numerous and everyone can select doors that match their personal style and the rest of the house. The exterior of any residential or commercial space requires more attention that people generally realize. You need to understand just like people, the first impression by a building also needs to be pleasant and positive. Imagine being invited to someone’s house for dinner and just as you walk up the driveway you are welcomed by a chipped, half painted, falling apart front door! Honestly, will you judge poorly of the house or the owner? Your house or any property you own is a direct reflection of your personality and your personal tastes. Like it or not, the owner is judged by the upkeep and look of a property. If you wish to make this impression a positive one, you need to constantly keep up with the maintenance and proper appearance of your house and property- inside and out! Wood front doors are highly popular and recommended for both residential as well as commercial spaces. Depending on the nature of use, different qualities of wood can be used to enhance the overall look and use of the doors. An expert from our team would be able to give the best recommendations after carefully assessing your individual and specific needs. We work according to the needs of our customers and go beyond our way to offer the best solutions. All our products come with the assurance of quality and we maintain the quality of our services be it installation, repair or any other services.